(Oradal) - Rich velvet red in colour, this very healthy Hybrid Tea produces long stemmed, intensely fragrant blooms of cut flower quality. A medal winner at the 2008 National Rose Trial Awards. Exhibition quality. Approx 1.6m tall. 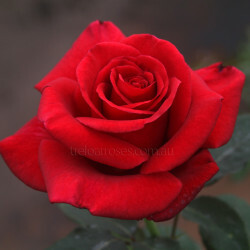 (Oradal) - Rich velvet red in colour, this very healthy Hybrid Tea produces long stemmed, intensely ..